The majority of the British population no longer attend church and, consequently, lack familiarity with the Christian tradition, its stories, language and metaphors. However, when bereaved, many still turn to church representatives, working in parish settings or chaplaincies, to perform funerals for their loved ones. 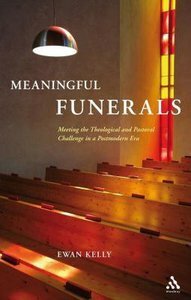 The key issue addressed in this book is how funerals may be created which are not only relevant for the bereaved, but also have theological integrity. A paradigm shift in the manner by which funerals are constructed is proposed - from imposing alien liturgies to creating a unique ritual which evolves from the meeting of the stories of the bereaved and that of the ritual leader.The argument for the co-construction of funerals is informed by contemporary models of grief and Kelly's own experience with bereaved parents who worked with hospital chaplains to co-construct funerals for their babies. Co-construction is a process which is centred on listening and empowering, and involves offering the bereaved choices from a range of ritual resources (sacred and secular) in order to help them shape their funeral's content. It is a model of ritual construction which requires time, availability and risk-taking on the part of the ritual leader but which significantly helps the spiritual needs of the bereaved to be met. Moreover, such a process facilitates sensitive regulation of grief in an age where its privatisation has meant the bereaved are often bereft of a means by which to benchmark their feelings, behaviour and decision making. Ewan Kelly initially studied medicine and worked as a junior doctor before completing a theology degree and becoming ordained as a Church of Scotland minister. He currently works as Programme Director for Healthcare Chaplaincy and Spiritual Care, NHS Education for Scotland and as a part-time senior Lecturer in Pastoral Theology at the University of Edinburgh, UK. 1. Introduction; 2. The Postmodern Context And The Recognition Of A Need For Ritual; 3. Grieving In A Postmodern Era; 4. Being And Doing In The Pastoral And Spiritual Care Of The Bereaved; 5. Ritualising Death - Formal And Informal Moments; 6. Co-construction - Meeting Spiritual Needs And Facilitating Grief; 7. Co-construction - Opportunities For The Church; 8. Paradigm Shifts; Appendix: Ritual Resources - Sacred And Secular.